The throwaway camera was a success on the Montauk Century. I thought that it would be even better if the camera were mounted on the handle bars so I wouldn't have to reach into a pocket for it. And I might capture some of the sort of shots that are gone by the time you've reached for the camera. 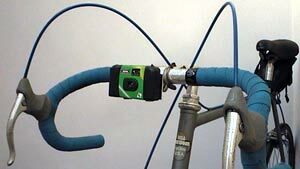 So I built BikeCam with a bent coat hanger, some pieces of plastic and Velcro. 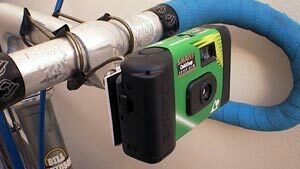 The camera can be pulled off its platform and reattached instantly. And it's always there, ready for use. It had to be tested. I set out with it on the week following the the ride to Nyack where I bumped into Ron and Jeffrey. Neither of them called me during the week so I set out by myself, mid-morning on a Saturday, headed for Nyack.